Set up your La Spaziale LUCCA A53. In this manual, you should find everything you to need to operate and maintain your dual boiler, saturated group espresso machine. 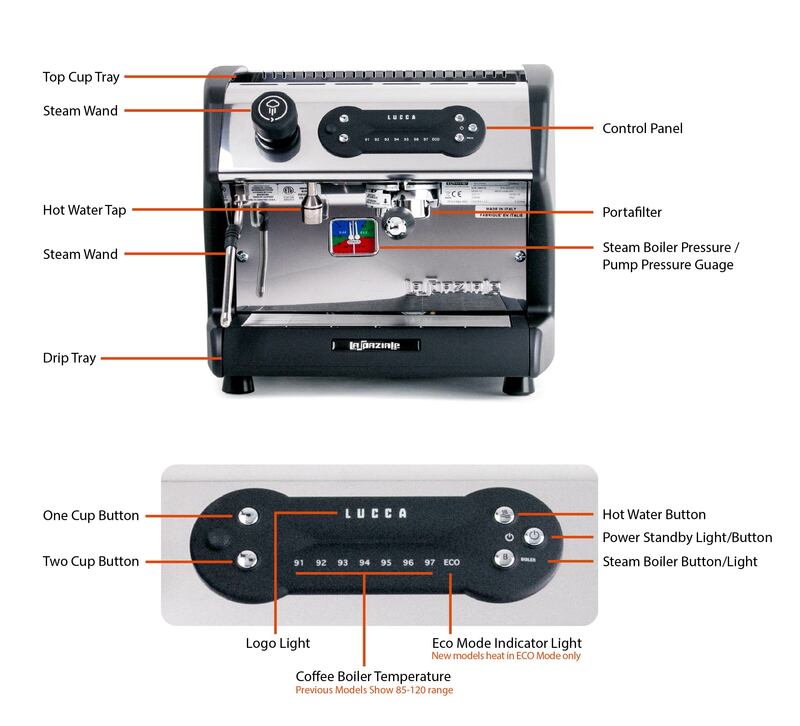 Please read carefully before using your LUCCA A53 Espresso Machine. Once you’ve attached the water inlet of your LUCCA A53 to a cold water line it is time to plug in your machine. The machine comes standard with a 20 amp plug but also has an adapter for regular three prong kitchen outlets. When the machine is plugged in the LUCCA light will illuminate and the power light will flash, signifying the machine is in standby mode. While the machine is in standby mode it will not heat and the pump will not turn on. The only way to turn off the lights completely would be unplugging the machine. Standby mode is functionally the 'off' position for the machine. To turn the machine on, hold the power button down for three seconds. The power light will now be constantly illuminated, the boiler light will flash, the third number from the left will flash (93 on current models), and the machine will begin automatically filling the steam boiler. Any time the machine notices the steam boiler has had more than one-ounce leave through the steam tip or hot water tap, the steam boiler will automatically refill. The steam boiler is now refilling from being completely drained so it will take around 30 seconds for it to fill to the correct level. Pressing the power button once will put the machine into standby mode. The power light will flash and the LUCCA light will remain lit. In standby mode your machine is off, boilers will not heat and your buttons will not engage. The lights will remain lit the entire time, you may unplug the machine to turn all indicator lights off. The machine will now begin heating. The numeric lights running horizontally across the control panel signify the heat of the coffee boiler, the third number from the left (93 on current models) will flash until the coffee boiler has reached operating temperature. The flashing boiler light signifies the heat of the steam boiler, the boiler light will flash until it has reached operating temperature as well. When the machine is in standard operating mode the top right button draws water through the steam tap. Tapping it once toggles the steam tap on and will continue to draw water until toggled off. The hot water tap will only draw water once the steam boiler has begun building pressure. Holding down the boiler button for five seconds will turn off the steam boiler, turning its light off. Holding the boiler button down for five seconds while it is off will turn the steam boiler back on and turn the boiler light on. The one cup and two cup buttons on the left side of the control panel are for brewing espresso. They are both preset to dose about 1.5 ounces of espresso. If your first few attempts at drawing a shot seem very far off in terms of the amount of espresso coming out before the machine stops, see the programming mode below on how to program volumetric dosing. At this point, your machine is set up and ready for use. Now you’ll get to dial in your grinder and begin pulling shots. Your grinder should come with a user manual, describing how to adjust the grind coarser and finer to get your espresso dialed in for the shot desired. When the machine is in standard operating mode, hold down the power button for five seconds; this will make the power light flash as well as the 93 light. To leave programming mode, tap the power button one more time and it will stop flashing and return to normal operation. From programming mode, you can adjust multiple functions on the machine. Tapping the hot water button in programming mode will bring the brew boiler target temperature up by one degree Celsius, as reflected by the number lit on the display. The Temperature can be increased to 97°C. Increasing it past 97°C will bring the temperature back down to the lowest temperature, 91°C. 93°C equates to almost exactly 200°F, the ideal brew temperature for a wide range of coffees and the default on most all espresso machines. Tapping the one cup or two cup button will begin to change the volumetric dose set for the button pressed. In order to accurately change the volumetric dose, you will need a portafilter with coffee in the group head to slow down the flow of water so the machine can accurately read how much water is desired per dose. Once you have the desired amount of espresso, tap the button you are currently programming again to stop the shot and save the new volumetric dose. If you attempt to change the volumetric dose without a portafilter with a puck in place, you will not get accurate dosing results. The programmable volumetric dosing feature allows programming of the Single Cup and Double Cup buttons to dispense set quantities of espresso. Many users only pull double shots and program the double shot button for 1.5-2.0 oz for that purpose. Then they program the single cup button for a larger amount for use in backflushing the group or pulling shots manually. The beauty of the programmable dosing feature is that the machine owner can be creative. the Standby light and the light indicating the set temperature will start flashing. Fill portafilter with freshly ground coffee and press with a 53mm tamper. Attach portafilter to group head and place a measuring cup under the portafilter. By pressing the Single Cup button the delivery starts and the 91-92-93 temperature indicators light up to show that the one-shot espresso dose is being programmed. When the coffee inside the cup has reached the desired quantity, press the Single Cup button again to stop the delivery. To lock the setting into memory, press the Power button once (do not hold). This will take you out of programming mode. Repeat steps above using the Double Cup button making sure you use freshly ground coffee in the portafilter. During programming of the Double Cup button, the 94-95-96 temperature indicators will light up. Early models have an optional 15 and 20 amp mode, set by Clive at 15 amp unless otherwise noted by the customer. In 15 amp mode, the machine will only heat one boiler at a time, first heating the coffee boiler and then the steam boiler. In 20 amp mode, the machine will heat both boilers at the same time. To change the machine between 15 and 20 amp, turn the machine off and remove the top panel from the machine by removing the Phillips screw in the circular hole on the top panel and lifting the panel out. From here you can see inside the machine and flip the two-way switch in the back right corner of the machine to the desired setting. From here if the "ECO" light is illuminated you can turn off the ECO light to put the machine in 20 amp mode by holding the boiler button down for 10 seconds until it turns off.